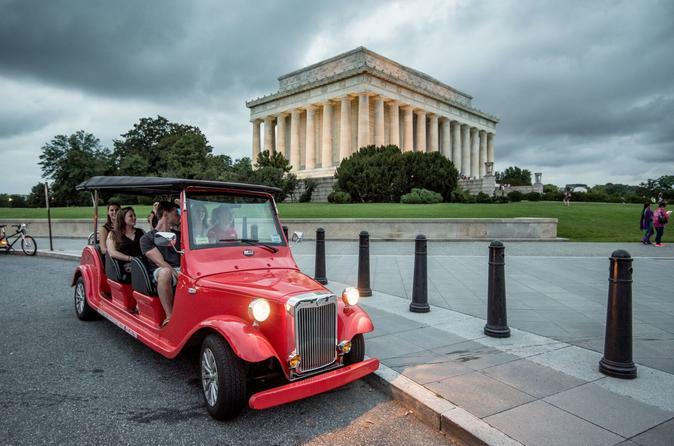 Enjoy a quirky and unconventional tour of one of the most historic buildings and museums in DC, the Smithsonian American Art Museum and National Portrait Gallery, before heading out to join our small group tour of the culture-rich National Mall on board our all-electric Red Roadster. Ready to take on a city full of history and art? We’ve combined two of our most amazing Washington tours (Smithsonian American Art Adventure and Monuments by Night) into one fun-filled evening. First, you’ll head into the Smithsonian American Art Museum and National Portrait Gallery where we’ll teach you about important American artists and some of the unsung heroes in our country’s story. We’ll talk about a local janitor’s 14-year masterpiece, which was found by chance in his garage, we’ll discuss the American dream, check out the original Singer sewing machine and get to know the key figures and power players of US history. Next, skip the crowded sidewalks and slide into our all-electric Red Roadsters to be guided around our beautifully lit nation’s capital at night. Our guides will take you back to the city’s origins and give you some tips for exploring the city on your own. We’ll work our way through the Smithsonian area, discussing the best exhibits in each. Then we’ll breeze past the Washington Monument, the Jefferson Memorial and around the tidal basin. You’ll also have the opportunity to hop out and explore on your own at the FDR, MLK and Lincoln Memorials. Finally, feast your eyes on the White House before heading to your next adventure.